Our first pick today for The 2018 PopCult Gift Guide is a tribute album that was released early this year. It’s a testament to the power and glory of Dr. Demento. In case you don’t know who that is, since 1974 Dr. Demento has hosted a weekly radio show devoted to the occasionally-abandoned art of novelty records, and he’s been a starmaker in the worlds of comedic music and audio bizarreness. The Dr. Demento Show holds a place in pop culture’s humor wing alongside Mad Magazine and The National Lampoon. His biggest discovery was Weird Al Yankovic, who famously slipped him a cassette of one of his original songs when Hansen visited his high school back in the mid-1970s, but he was also responsible for bringing Barnes and Barnes, Richard Cheese, Judy Tenuta, Emo Philips and others into the mainstream. Hansen not only discovered these artists, but in many cases he nurtured and encouraged them. All but one of the 19 tunes on Dr. Demento: Covered In Punk, were recorded especially for the set. Only a never-released Joan Jett & the Blackhearts’ version of “Science Fiction/Double Feature” from The Rocky Horror Show already existed. 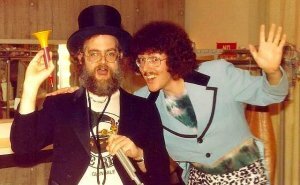 On the record, Dr. Demento provides newly-recorded commentary between songs, so that it recreates the experience of listening to The Dr. Demento Show. It’s like an extended episode of his show, with all-new music. You should be able to order Dr. Demento: Covered In Punk from any record store that carries new releases, or you can turn to Amazon or the record label.